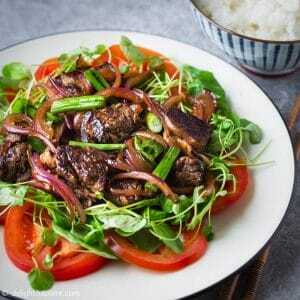 Vietnamese Shaking Beef (Bo Luc Lac) is an easy and delicious one-pan meal that is excellent for everyday meals as well as special occasions. 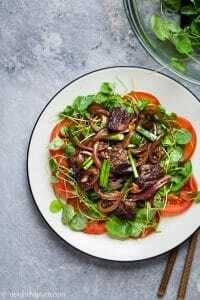 This dish features tender and flavorful beef plated on a bed of green cress and fresh tomatoes. In Vietnamese, “bo” means beef and “luc lac” means shaking. The funny name of this dish comes from the way it is cooked. The cook adds beef to a hot pan and then shakes the pan constantly to cook/sear and move the meat around. 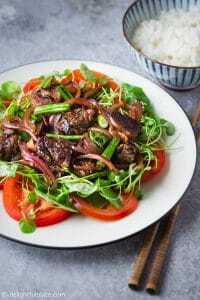 I think this Southern Vietnamese dish is a popular menu item in a lot of restaurants in the U.S. Vietnamese cooks in the U.S. often plate it on a bed of watercress and tomato salad and serve with rice. I think it even goes great with fries and bread. We have been adding this dish to our meal rotation because it is tasty and doesn’t require a lot of efforts to make. I simply love a one-pan meal that is freshly prepared and can be put on the table in 30 minutes. The first ingredient is of course beef. 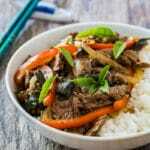 Vietnamese cooks generally agree that the higher quality cut of meat, the more delicious the dish will be. Many like to use tender cut like filet mignon. I like to use ribeye after trimming off excess fat because it’s very flavorful. So just pick a good quality cut of beef that you like. I often use baby cress to make the bed of salad under the beef. It is much more tender than watercress, and I recently read some articles that say it’s not totally safe to eat watercress raw. 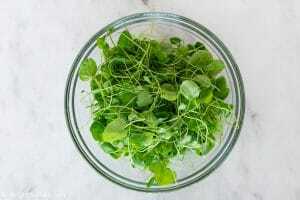 If you can’t find baby cress, you can use baby arugula although it is more peppery than cress. 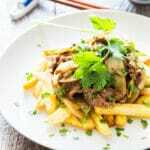 Other ingredients are just aromatics and common Vietnamese condiments that you can easily find at both Asian and Western grocery stores or on Amazon. Most home kitchens don’t have high-power stove like those at restaurants. 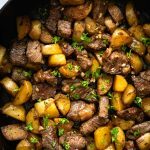 Therefore it is harder to make this dish by using a wok in which we can shake the beef around since a traditional wok works best on a powerful gas stove. You need to heat your cast iron pan until it is very hot and then start to cook. From that point, it takes less than five minutes to finish the dish. Anything longer than that, you will overcook the meat. Also, if the pan is not hot enough, we can’t get a nice sear, and we would be steaming the beef instead, and when we add the sauce, the dish will become soupy which is a disaster. Another thing to keep in mind is to have all ingredients ready before you start to cook because everything comes together in just a few minutes on the stove. Detailed instructions and step-by-step photos are in the recipe card below. Dice the beef into 1 1/4 inch thick cubes. Marinate with 1/4 teaspoon salt, 1/4 teaspoon sugar, plenty of black pepper. Set aside to come near to room temperature. Mix the cress with 2 teaspoons of rice vinegar, 1/4 teaspoon of sugar. Slice the tomato thinly. Arrange the cress salad and tomato slices on a serving plate. 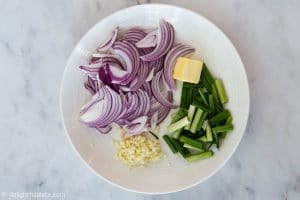 Thinly slice red onion. Cut scallions into 1 1/2 inch long pieces. Mince the garlic. 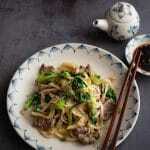 In a bowl, combine all ingredients to make the soy sauce mixture. Taste and adjust the sauce to your liking, set aside. 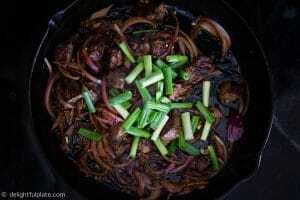 Place a wok or a heavy-bottomed pan over medium-high to high heat. 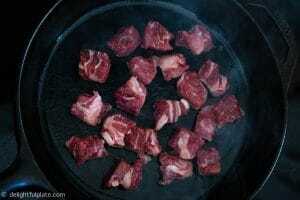 When the pan is hot, add oil and then add the beef cubes. Sear for 45 seconds to 1 minute until brown and then flip to the other side, sear for 45 seconds or until brown. Work in batches if needed. 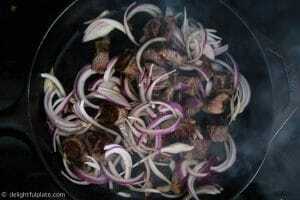 Add onion slices to the pan, stir-fry the beef and onion for about 30 seconds. Add the soy sauce mixture, shake the wok or stir to coat the beef with the sauce. Then add the butter and garlic, constantly stir and cook for a few seconds or until butter melts completely and everything is combined. This step should be done very quickly to avoid over-cooking the beef. Add the scallion pieces, quickly mix together and then transfer the beef to the serving plate on top of the cress and tomato.